Let us help you Advertise on Facebook. Over One Billion people. Let us help you reach the right ones. PositionKing offers complete Facebook Setup, custom backgrounds, optimization and management. Your business is for your customers. Build relationships with them, reach new people and drive sales using Facebook. Information on this page provided by Facebook.com Busines Pages. A real example of what businesses have done to expand their customer base and drive sales on Facebook. Interested in music to see if they would purchase bikes, including people with an interest in Arcade Fire, M83 and Passion Pit. 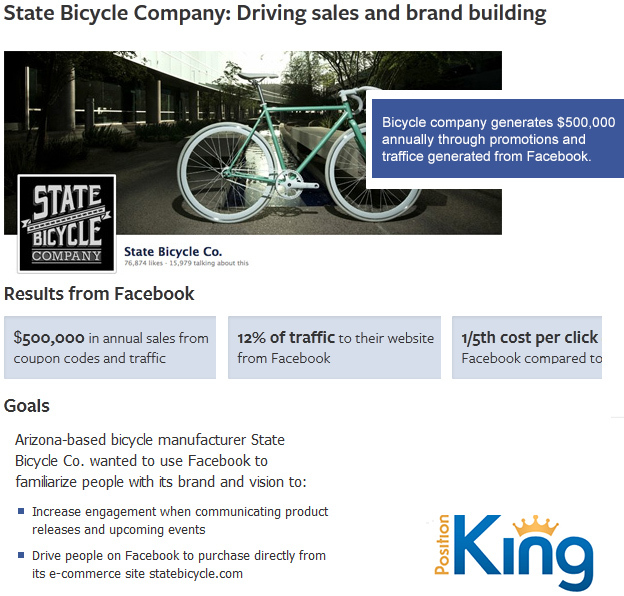 Used a sponsored story to increase the distribution of a Page post by featuring an image of a Black Friday poster with deals on State Bicycle Co. items.